Nothing like cutting things fine... Two hours before deadline and I'm only finally posting! Getting going with all this blogging/instagramming/pinterest malarky has made me realise I really do need to make somewhere in my home that I can hang a finished quilt to photograph it. The floor really isn't working so well. 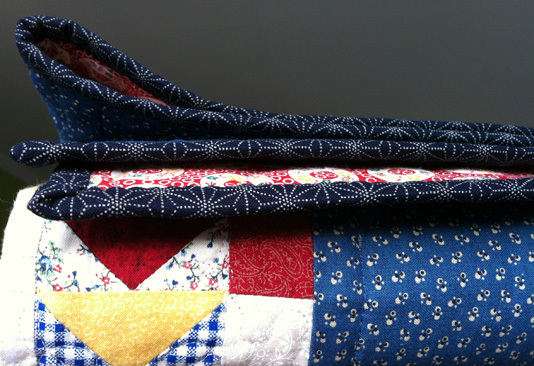 Anyway, since you've already seen this quilt in full here, I'll just show you the finished bits now. First, there's the leaf that's finally appliqued on. At least, I think that's the leaf... Now that they're all sewn on, I'm not so sure! Then, there are the buttons on the the birdhouses. I've found a great new button shop that I'll have to tell you about soon. And last, but not least, the binding! 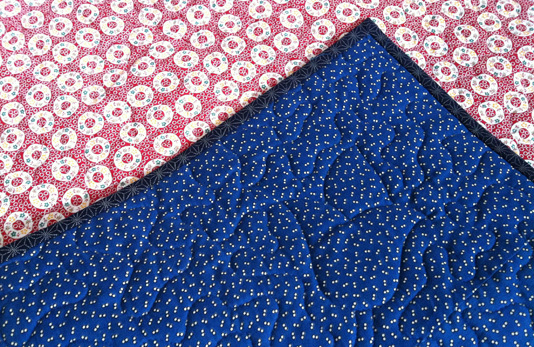 I used the tutorial that I blogged about in the mid-month check-in, the only thing I changed was trimming a bit off the corners of the quilt, as I found the first corner really bulky when I bound it. Goodness, then tomorrow will be March and I'll be onto the next one. BIG month for March. The wedding quilt has to be finished! Hope everyone else got their February projects done. Thanks to you and Melissa for this great idea. I can't believe I've finally finished this quilt! I love buttons, you will have to share where you got your cute ones. Great job on the finish.